For sale is this new Gildan brand 100% ultra cotton tee shirt. It is a heavy weight 6.1 oz cotton. Due to the cotton knit it does shrink about 3/4" in width and length with the first wash. It washes and dries great, retains it's shape and color very well. All tee shirts are unisex sized. 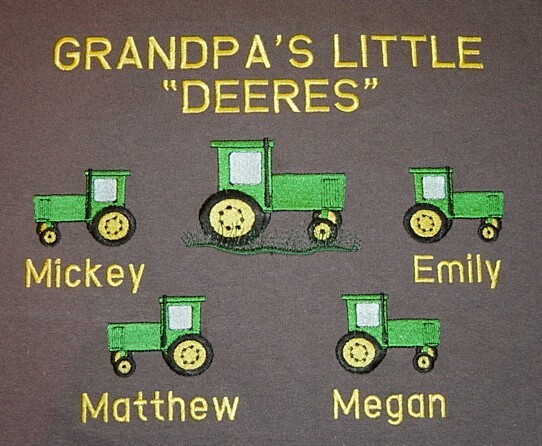 I will embroider this cute tractor design on the front chest. The price includes up to 3 children/tractors. Any additional children is $3.50 each. the max. # of children is 8. You may change the wording on the design including Grandma who may be the gardener in the family. If you want the wording done in different color threads that can be done too. This design as I have shown it measures 7.8" x 6.8" but it will vary according to wording and number of children on it. I use the finest rayon embroidery threads for the best sheen and color available.